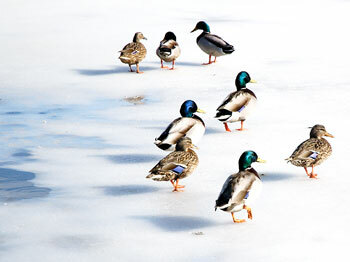 Ducks walk on the ice at Mirror Lake. Every 10 years since the 1930s, the National Research Council (NRC) of the National Academy of Sciences has ranked graduate programs at colleges around the country. But the rankings have not been done since 1992, and the new rankings – due out in 2007 – will be based on a completely new methodology. Linda Flaherty-Goldsmith, the University’s first chief operating officer, has resigned and will leave UConn at the end of the spring semester. Whitney Dining Hall is now serving eggs given the “Certified Humane Raised and Handled” label by Humane Farm Animal Care, the non-profit national organization that certifies the humane treatment of animals raised by meat, poultry, egg or dairy producers. For Provost Peter Nicholls – a man who studied in one country and works in another – developing global citizens is a major goal for the University during the next five years. And the Study Abroad program is taking him seriously.